South Asia is the birthplace of four of the world’s religions: Hinduism, Buddhism, Sikhism, and Jainism. Three that come from West Asia: Christianity, Islam, and Judaism arrived later. Zoroastrianism, the major religion in ancient Persia (now Iran) until it became Muslim, also survives in India. Unlike many of the world’s religions, Hinduism has no founder, but rather evolved over time. It is not only one religion, but a group of related beliefs. There are many different ways of seeing god in Hinduism, but many people believe that these are only one representation among many. The different images of gods and goddesses are all ways of seeing Most Hindu sects share a few elements in common with each other. Dharma is a word which may have many meaning in English. Among them are duty, merit, and law. To most Hindus, a person’s dharma is their duty in life according to their family relationship, their local community, and their god. Karma literally means “action”. To most Hindus, karma are actions performed in order to be sure that they fulfill their dharma. This is the idea of reincarnation. In most Hindu sects, when a person dies, their soul is reborn again in another form. The form of this next birth is determined by the karma they performed, and whether they fulfilled their dharma. Siddartha Gautama, the man who became know as “the Buddha”, was born in what is now Nepal. Siddartha was a young prince in a small kingdom in what is now Lumbini in south central Nepal. His father was a wealthy king who dreamed that one day his son would inherit his crown and be a king as well. Siddartha left his life of luxury in the palace and gave up all worldly possessions. He tried many different methods of meditation as a monk, but eventually started his own school, or philosophy, to end the suffering of people on earth. While he saw himself as just a teacher, giving his Four Noble Truths and the Eight-Fold Path lessons to the people, many thought of him as a divine messenger, a god. He was called, “Buddha, the enlightened one” and is considered to be the founder of the Buddhist faith found all around the world. He gave his first sermon following his enlightenment at a deer park near the city of Varanasi in India. 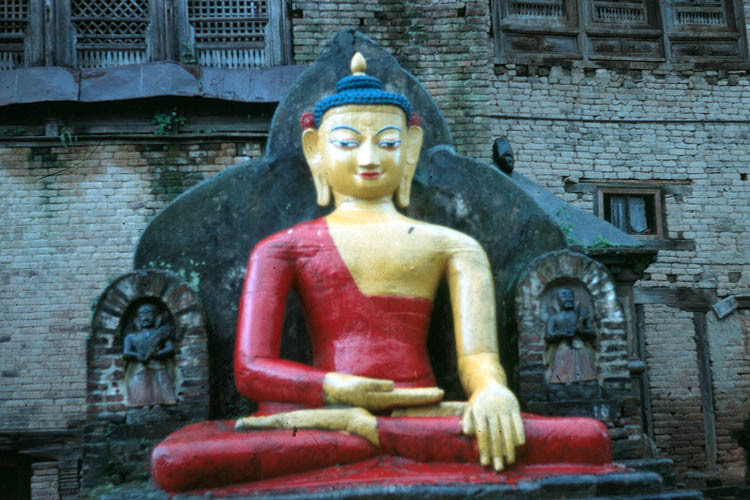 Today, Buddhism in South Asia exists primarily in Sri Lanka, Bhutan, Nepal, and Tibet. Buddhism gradually went into decline in India and spread to East and Southeast Asia where it remains prominent today. Jainism arose in northern India around the same time as Buddhism. The historical founder is Mahavira, who according to some was the last of a long line of teachers who reformedthe Jain faith. One of the primary contributions of Jainism is the doctrine of “ahimsa” or non-injury. According to this doctrine, Jains, especially monks, avoid killing living things. Mahatma Gandhi employed this idea as non-violence in the struggle for Indian independence meaning that his followers, although many times beaten and struck for their protest, would not strike back. It is believed that one of the tribes of Israel arrived in south India soon after the destruction of the temple in Jerusalem. A local king granted the refugees land on which to make their home and worship. Today, the Jewish community in India is very small with many in recent years emigrating to Israel. The legacy of the Jewish community in such cities as Cochin, located in the southern state of Kerala are the synagogues. Saint Thomas arrived in India in the 2nd century. This religion arrived in India through refugees from Persia. People who practice this religion in India are known as “Parsees”, which refers to their origins in Persia. It is related to the early Vedic religion of India which later grew into modern Hinduism. Its major scripture is called the Avesta and contains hymns as does the Vedas in India.